On November 17 and 18, the Statewide Hispanic Chamber of Commerce of New Jersey invited me to attend a Nonprofit Executive Program offered by the United States Hispanic Chamber of Commerce (USHCC) in nothing less than marvelous Las Vegas. Lucky me! His promise? “I will help your organization elevate its business relationships from ordinary to extraordinary, in service, results and profitability,” Ed said. 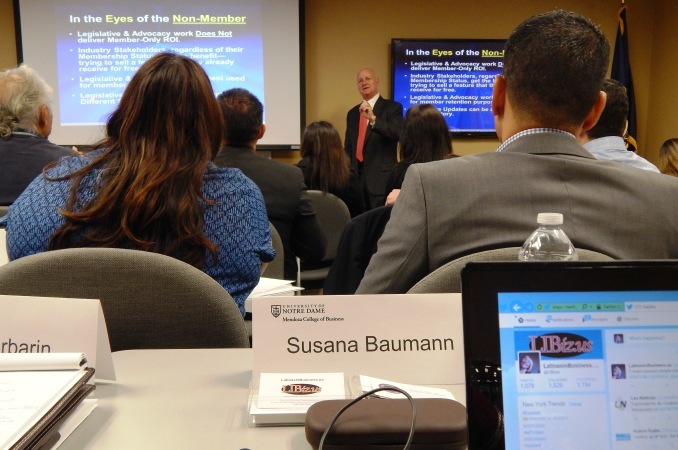 In attendance were 52 participants from Hispanic chambers and professional associations from all over the country. The annual event attracts the best speakers to share their knowledge and experience to USHCC’s chambers members. “We have been offering similar program to USHCC organizations for five years,” said Kim Brumbaugh, Non Profit Executive Programs Manager at Notre Dame. “The advantage of this group of participants is that there is some homogeneity in the type of problems, needs and answers they are looking for. When attendees come from different global locations, sometimes they differ greatly in the wide range of complexity and necessities they come here to solve,” she said. Ed Rigsbee, President of Rigsbee Enterprises Inc., is a well-known expert in strategic alliance development and implementation and non-profit member recruitment and retention who has authored several books including his last “The ROI of Membership,” in which he based his training. He must know everything about strategy as he is also a retired US Soccer Federation referee! The intensive two-day training was seconded by the presence of Dr. Laura Murillo, who delivered a short address during the first day lunch break aimed at sharing her experience as President and CEO of the Houston Hispanic Chamber of Commerce. During the second day lunch break, the Nevada District Director of the SBA Robert Holguin summarized some of the SBA Initiatives and Successes. Please click on the photo gallery to see some highlights of the event. I apologize if some names are missing, please share with us your name and affiliation if you are posted on one of the pictures (numbered for easy identification) and I will add you to the caption. Enjoy! 15 Thank you Ed for a wonderful training!